In our house lentils are known as “cowboy food.” I still haven’t understood exactly why, but Thomas peddles his lentils-with-a-fried-egg dinner as such. And it works very well. The children might even call it their favorite dinner – it’s all about marketing, really. I like this technique for cooking lentils, which breaks up the process into two basic steps: First cook the lentils in lots of water with aromatics and vegetables cut into large chunks until barely al dente. Remove from heat and discard the pieces of vegetables and herbs. Then brown more of the same vegetables, finely diced, return the lentils to the pan with the vegetable mirepoix (the finely diced vegetables browned in olive oil), and reheat until the lentils are cooked to desired consistency. This recipe uses red onions and fennel, but yellow onions work just as well, and carrots and/or celery replace the fennel perfectly. I change it according to my mood, the rest of the meal, or what happens to be in the house. Pick through the lentils to look for small stone intruders that must be discarded. To wash lentils, cover with cold water and drain in a fine mesh sieve. Peel and cut into large chunks half an onion and half a fennel, reserving the rest for later. Place lentils into a large saucepan with 4 cups (double the volume) water. Add the vegetable chunks, a few sprigs of parsley, and the bay leaves, bring to a boil and let simmer, covered, for about 20 minutes. Remove from heat when the lentils are just starting to soften but still retain a nice bite (they will cook a bit more later). 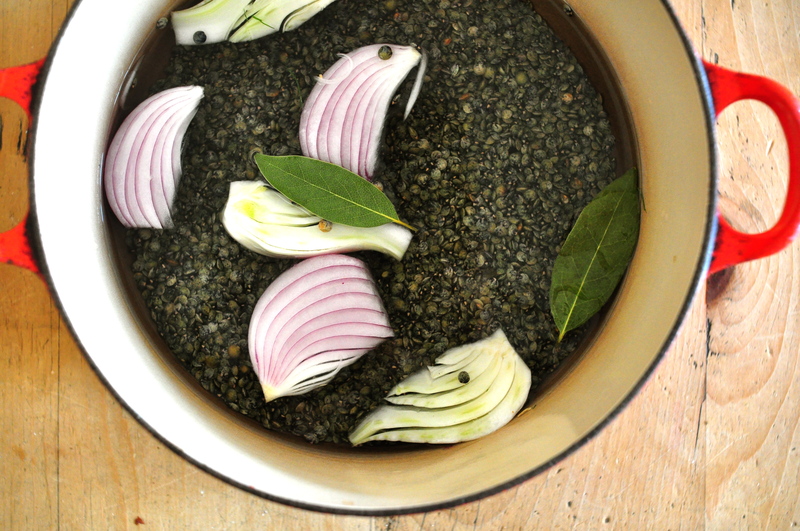 Discard the sprigs of parsley, bay leaves, and vegetable chunks, pour the lentils into a large bowl, and set aside. Quickly rinse and dry the saucepan for reuse. Heat enough olive oil to cover the base of the saucepan. Add the onion and cook until nicely brown, stirring occasionally. Add the fennel and sweat for a few minutes until it becomes translucent. Add the lentils with some of the excess liquid. **The lentils should remain moist and shiny but not swimming in liquid. If necessary add of dash of plain water to prevent the lentils from drying out. ** Season generously with salt and pepper and heat gently. The lentils will continue to cook, so test and remove from the stove when they have reached the desired consistency (I personally like lentils to retain some bite). Check the salt and pepper seasoning, adjust, add 2 tablespoons of the best olive oil and 1 tablespoon each of balsamic and red wine vinegars [and the pancetta], stir in the chopped parsley, and serve warm. This entry was posted on 4 March 2011 at 11:48 and is filed under Fall, Lentils / Chickpeas / Legumes, Spring, Summer, Winter, Year-round. You can follow any responses to this entry through the RSS 2.0 feed. You can skip to the end and leave a response. Pinging is currently not allowed. I’ve never used fennel this way, sounds interesting. And pancetta is only optional if you don’t have it. Can’t wait to try this out.